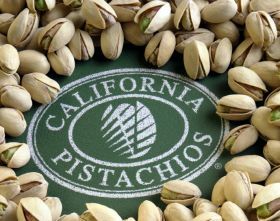 Results of new research presented at the American Society of Nutrition in San Diego have backed an increasing amount of scientific evidence that seemingly underscores the health benefits of eating pistachios. A study conducted at the Institute of Food Research (IFR) in the UK in conjunction with the University of Messina, Italy, confirmed that key nutrients in pistachios with strong antioxidant qualities – Polyphenols, carotenoids (vitamin A) and tocopherols (vitamin E) – are released during digestion and are thus able to be absorbed in the gastrointestinal tract. In the study, which began in 2010 and was funded by the American Pistachio Growers, researchers tested raw, roasted and salted pistachios and muffins made with raw pistachios in an in vitro model of digestion which simulates the human stomach and small intestine. The bioaccessibility of the nutrients in pistachios was evaluated at various stages during the digestion process, while each measurement was performed in triplicate for the three tested models. "These results are significant as they are the first that show when the bioactive compounds in pistachios are released during digestion and are available to be taken up by the body," said Giuseppina Mandalari, research scientist at IFR and lead investigator of the study. "This research indicates these nutrients would contribute to the beneficial relationship between pistachio consumption and health-related outcomes, such as heart disease."